Machine Learning (ML) An Approach to Achieve Artificial Intelligence—Subfield of AI that aims to teach computers the ability to do tasks with data, without explicit programming. Uses numerical and statistical approaches, including artificial neural networks to encode learning in models. Models built using “training” computation runs or through usage. Deep Learning (DL) A Technique for Implementing Machine Learning—Subfield of ML that uses specialized techniques involving multi-layer (2+) artificial neural networks. Layering allows cascaded learning and abstraction levels (e.g. line -> shape -> object -> scene). Computationally intensive enabled by clouds, GPUs, and specialized HW such as FPGAs, TPUs, etc. Gaining clarity as to these different categories of AI and example use cases is an important first step. Of course, not everyone needs the depth of knowledge of a programmer, but a baseline level of knowledge across the organization can help get everyone on the same page at least in terms of recognizing when AI solutions may make sense. Clearly, solving a problem is an imperative for any AI implementation to address or the technology is just “a hammer looking for a nail.” Organizations needn’t jump to advanced AI use cases to get started. Even tactical solutions using basic AI technology can be a great way to begin and can help to build experience as well as a fit-for-future architecture. As an example, back-office functions such as procurement are becoming digitally-transformed via AI and related technologies, so it’s important to look beyond the obvious candidates for problem solving such as e-commerce and customer services. It’s estimated that 52% of a procurement organization’s time is spent on transactional activities and that automation technologies, supported by robust ML algorithms, will enable organizations to perform these activities at much greater speed, lower cost, and higher accuracy. Robotic Process Automation (RPA), in particular, is expected to be able to unlock a staggering 25-50% cost savings. One useful approach to identify business opportunities is via innovation workshops. These event-based ideation (idea generation) sessions can help to quickly identify and prioritize the most promising business opportunities and help an organization gain consensus at the same time. They can also uncover both tactical and strategic ideas and opportunities that you can place on the near- and longer-term implementation roadmap respectively. When planning these sessions, be sure to invite a cross-functional group of participants and look across all business units and departments for suitable attendees. AI has applicability and can act as a strategic lever within business processes located across the entire enterprise, so it’s important to look for a diverse set of participants who can represent the many and varied needs and interests across the entire organization. Picking the right AI technology is really all about having a vision for the business processes you wish to enable, knowing the categories of AI and their applicability and envisioning the future handoffs between humans and machines. In “Navigating AI strategy in your industry,” we found that it’s important to explore the intersection of AI categories with specific business functions—even down to the level of specific job codes. The automation potential for each AI use case will enable you to calculate the impact on each specific business function or job code. For example, if the delivery role at a hospital can be automated up to 80 percent via delivery robots, this enables a number of staff roles to be reallocated and refocused on higher value activities and priorities such as providing the best possible patient care. In addition to focusing on the machine tasks and the new, higher value human tasks, be sure to explore how the various process handoffs will occur where both people and machines are required to work together. This will be one of the next areas for world-leading organizations to optimize their performance. In “The digital disruption of strategy,” the rapid pace of digital transformation points to the importance of corporate strategy processes being equally fast and agile. This means that rather than developing a big picture strategy on an annual or even less frequent basis, be sure to iterate strategies at least quarterly and revise them based on key learnings from pilots and proof of concepts. 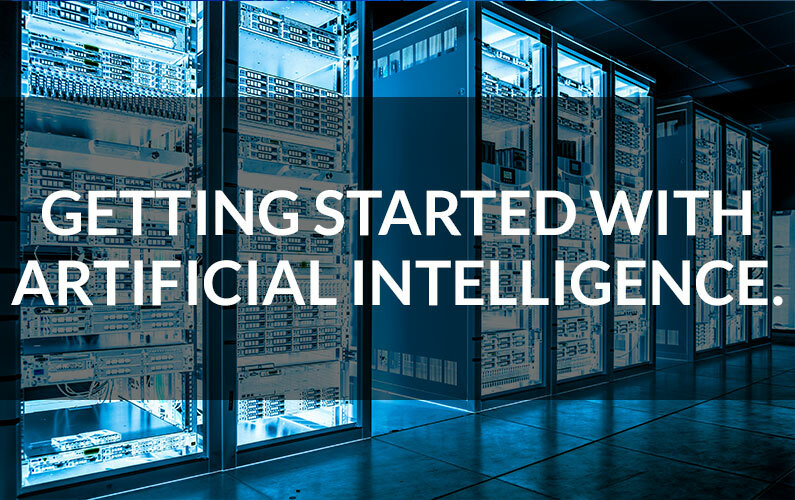 As you deploy various AI pilots and gain key learnings from customers and employees, you can feed this insight back into your AI strategy and refine your approach as needed. For example, insights from fairly tactical deployments of AI, such as chatbots for e-commerce and intelligent agents for customer service, may inform larger scale deployments with greater revenue, cost savings or business decisions on the line. This iterative approach helps build a robust technical foundation for AI by starting with the basics before moving into more sophisticated techniques and algorithms. While AI may seem formidable, it’s another one of many technologies in the toolkit that you can apply to innovate your products and services. Starting with tactical deployments and utilizing MVP approaches to gain key learnings and feedback, you can iterate and constantly improve both the technical approach as well as the customer value proposition. As stated by Andrew Oliver in InfoWorld, “Just like the word processor replaced the typewriter pool, AI will soon replace hordes of office workers staring at Excel—and replace some analysts too.” It will be important to prepare for this change and to think about the higher value activities that your workforce can solve once AI is in place. By focusing on practical steps such as education, problem solving, fit-for-purpose technologies and an iterative approach to strategy as well as deployments, you can ensure a smooth AI adoption approach with better results and fewer surprises.